Posted on October 3, 2014 by J. 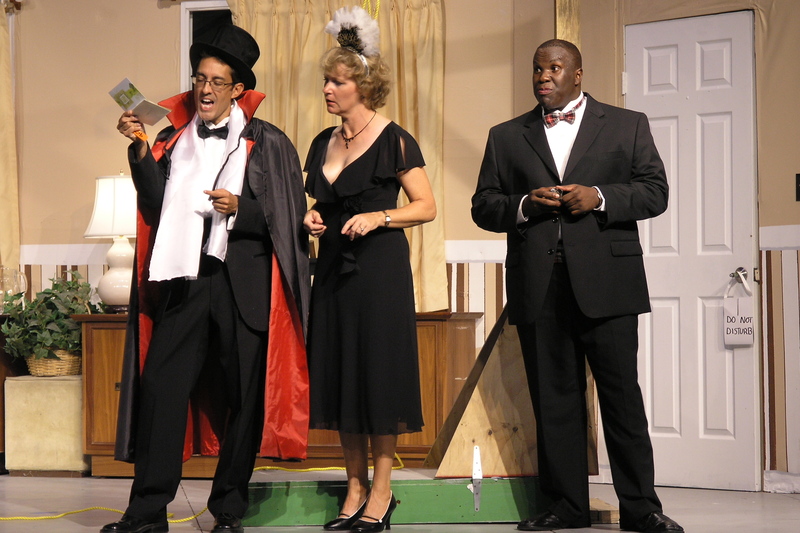 Several years passed, and we met up on stage again for Blithe Spirit. Charlie had two other productions under his director’s belt, and had considerably more confidence in what he was doing. But he had also reached the stage where he thought the director needed to control everything in the experience. He came to rehearsals with distinct and largely immutable ideas about what needed to happen and when. There was little room for flexibility in the blocking he had created. Gone was the collegial atmosphere; instead, the cast was busy trying to give him what he wanted, sometimes sacrificing what we felt was true to our character in the process. Another couple of years, another show: the ambitious Woman in Mind. Shortly after Blithe Spirit, Charlie had read and taken to heart Marshall W. Mason’s book on directing, Creating Life on Stage: A Director’s Approach to Working with Actors. Gone was the autocratic director; in his place was a director concerned with giving space and assistance to his actors to create more organically-driven characters. Charlie and I still disagree about whether or not the stage directions in a script are sacrosanct, and have agreed to disagree on this particular point. Despite this, while Blithe Spirit was a difficult experience for me, given my own approach to acting, Woman in Mind was very rewarding. Charlie’s trajectory as a director is not unusual. That middle stage is probably unavoidable. As with most things in life, it’s difficult to know where “balance” is until you go too far and find yourself out of balance. A director with self-awareness and a desire to improve will move out of the middle phase, but I’m sure there are others who remain stuck in that position. So what are you, as an actor, to do when you find yourself working with a director who is in this middle stage, who perceives his role as The Decider, and tells you what to do when? First, understand that he is learning his job just as you are. You go through stages as an actor where you aren’t working to your full potential, because you’re still learning your craft, so cut him the slack you’d like yourself. He is doing the best he can, and doesn’t yet see that controlling everything doesn’t produce the best result. Don’t challenge his authority too directly. Control is very important to him; honor that while expressing your own opinions and needs. Genuinely try to make what he asks work. Only ask to do something differently if you can’t. If you do this, he’ll both see your efforts and feel your pain. Be clear about why something isn’t working for you without making the director sound stupid or wrong. In other words, you can’t change the director’s approach. You’ve got to figure out how to work within it to produce the best result with the least stress. Accept that you can’t work in precisely the way you might like to, but negotiate courteously for the things you really need to be comfortable. This entry was posted in Acting, Directing, Rehearsing, Uncategorized and tagged Acting, acting technique, Actor, Community Theater, diff, Directing, Rehearsing. Bookmark the permalink.